Luke Richardson wasn’t the fancy pair of dress shoes you’d wear for a night on the town. He was your work boots. He wasn’t the curvy sports car you’d cruise Jasper Avenue in. He was the reliable mini-van. Richardson was an honest player who went about his business quietly and without fanfare. No sizzle, all substance. He was the kind of defenseman every NHL team needs. The Edmonton Oilers had Richardson for 436 games of an NHL career that spanned 1,417 games, and while it’s fair to note that the big blueliner from Ottawa never put up the kind of attention-grabbing offensive numbers to justify being drafted seventh overall by Toronto in 1987, only two players from his draft year played more games – Brendan Shanahan (1,524) and Glen Wesley (1,457). Richardson got the job done. 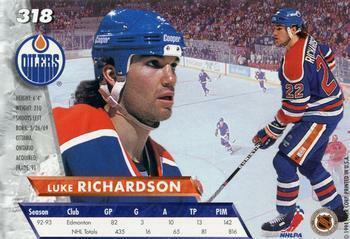 By the time Richardson arrived in Edmonton via trade from Toronto for the 1991-92 season — with Vincent Damphousse, Scott Thornton, Peter Ing, future considerations and cash in exchange for Grant Fuhr, Glenn Anderson and Craig Berube – the Oilers were a shadow of the team that won the fifth Stanley Cup in franchise history in 1990. Less than a shadow, actually. The big names who’d hoisted all those Cups were gone, traded and sold off by owner Peter Pocklington. The Oiler teams Richardson toiled for never won more than 36 games in a season and missed the playoffs altogether in four of his six seasons in Edmonton, the low point being a 60-point campaign in 1992-93. While Richardson didn’t have the appetite for destruction and mayhem other Oiler blueliners like Dave Manson, Bryan Marchment, Igor Ulanov or Craig Muni did, he was a stay-at-home type who’d bang, block shots and do the dirty work in front of the net. Richardson never needed a written invitation to back-up his teammates. Despite logging tough minutes, Richardson played 82 games in three of his six seasons here and missed just 22 games overall. Back in the days when reporters could stop by the Oiler dressing room to sit, have a coffee and chat with players one-on-one rather than be herded into scrums, it became obvious to me that Richardson was a real student of the game, one of those meat-and-potatoes guys who could have a career in coaching down the road if he wanted it. That, when Richardson retired during the 2008-09 season after playing just two games with the Ottawa Senators, is how it played out. After three seasons as an assistant coach with the Senators, Richardson was named head coach of AHL affiliate Binghamton, where he remains today. On a tragic personal note, Richardson’s daughter, Daron, committed suicide at the age of 14 at the family home in Ottawa in November 2010. In the years since then, Luke and wife Stephanie have spearheaded a program — Do It for Daron — that encourages teens, care-givers, coaches and teachers to discuss mental illness. You can read about that here. He reminded me of Jarret Stoll, not a lot of points but hard working. Often the best coaches are not the most naturally talented players. That is heart-breaking to hear about his daughter. Anyone with teenagers in their life would be well advised to check out that link. Lots of examples of that, starting with guys like Glen Sather. They learn the game because they can’t get by on being more talented than the next guy. As for the link, yes. Worth reading, even if you don’t have children. Anybody who teaches, coaches or deals with teenagers in any walk of life can make a difference. Always liked him. Even when he was with Toronto. I don’t know why. I never met him. As soon as I saw who it was this time, I wondered what he was doing now. Thanks for the update. Remember him fondly………made simple safe plays. Good to hear he is coaching in the AHL ……..really surprised that he was still playing in 2008 though. He was one of my favourites. Everyone needs a minivan to cart the kiddies around. Fact. But how was Jultz #94??? Great player, got the job done. Loved how mean he could be. I remember being a teenager when Richardson was with the Oilers and meeting him at a local video store where he was doing an autograph session. I recall there were about 10 ppl total there……he was never Mr. Popular or very flashy, but he was certainly a workhouse and a very kind person. My favourite Luke Richardson story actually involves Joe Sakic. Not sure how much of it is apocryphal and how much is true, but story goes that, at the 1987 NHL Entry Draft, there was some sort of meet-the-players event where the top 20 or so prospects all lined up in a row, wearing their junior jerseys. Among the players in that lineup were Shanahan, Richardson, Pierre Turgeon, Glen Wesley, and several others who were all well over six feet and 200 pounds. Also in that lineup, standing right beside, pretty close to Shanahan and Richardson was Joe Sakic, who looked every bit of the five-foot-10, 170 pounds he was at the time. He was right. Sakic ended falling all the way to Quebec’s 15th overall pick, in large part because of the largeness of the other prospects, including Richardson. Really impressed me his first game as an Oiler when he fought to back up his new teammates.